Paula McCartney has been making unique and limited edition artist books for many years. She sees the book as a medium and visualizes much of her photographic work in book form, many of her photographs exist only in the artist book. McCartneyâ€™s first trade edition, published by Princeton Architectural Press, will be welcomed by individual collectors interested in McCartneyâ€™s work, as it is both affordable in comparison to her artist books and beautiful. 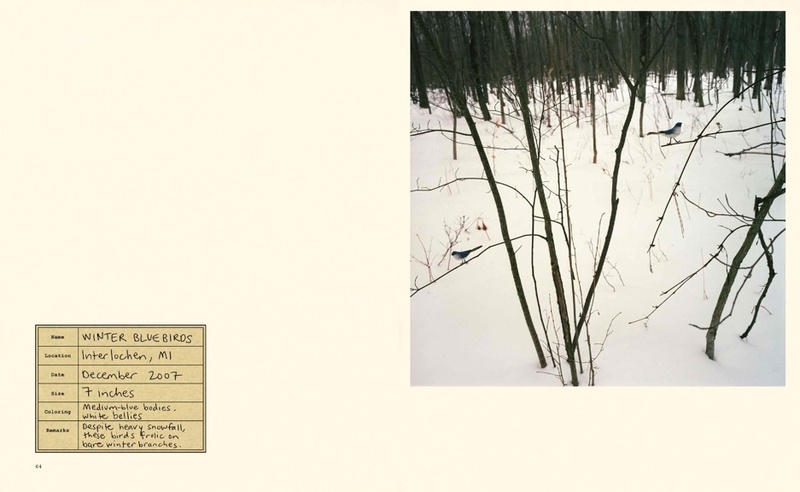 The monograph is an expanded version of her artist book Bird Watching and includes every image from the series. Mimicking a private field guide journal, McCartney takes the reader on the most successful bird watching quest, or so it seems at first glance. McCartney meticulously notes all the necessary details for credible bird watching â€“ name, location, date, size, coloring and remarks. She also includes drawings, diagrams, plant specimens, a life list, and journal-like notes about her bird watching travels. 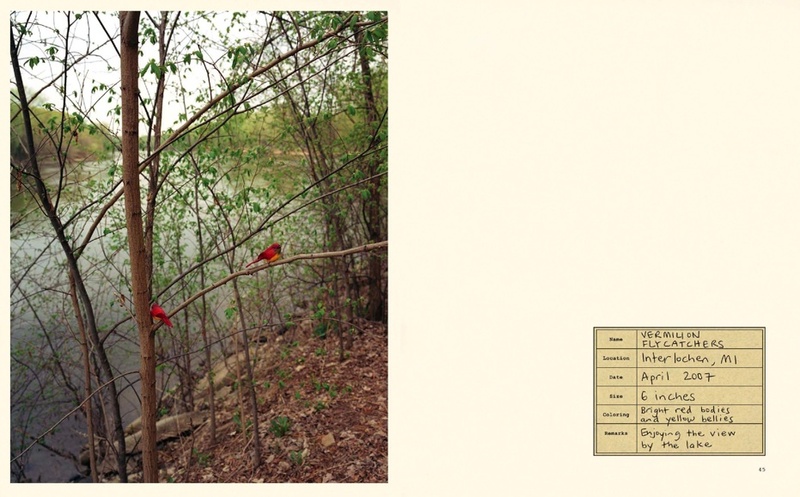 What makes this book obviously much more than a personal field journal are the added elements of context â€“ essays by Karen Irvine and Darius Himes, the playfully subtle references to the creative fiction McCartney has crafted (the map of â€œMigration Patterns of a Bird Watcherâ€�), and, of course, the photographs. No bird watcher could ever capture what McCartney has captured in her images. McCartney set up her camera just feet away from the birds â€“ an unrealistic closeness â€“ as though she said, â€œHey bird, stay right there. Let me take your picture. Could you move a little more to the left on that branch? Okay. Great. Thatâ€™s the shot!â€� McCartney has taken the watching, the waiting, and the long lens out of bird watching to create stunning photographs of forests and brush with perfectly placed birds â€“ and I do mean placed. McCartney has wired these birds to their branches in the real natural environment. As opposed to McCartneyâ€™s earlier series â€œBronx Zooâ€� of real birds in constructed habitats, she reverses the elements, putting faux birds in the real environment and does so in a much more convincing way than pink flamingo lawn ornaments or deer statues on the woodland edge of a suburban lawn. Realizing this forgery, I started to question many things in the book. Can one actually find a Northern Cardinal in Oregon at all? Are the plant specimens real? I am caught up in McCartneyâ€™s fictitious creation, but I donâ€™t mind. I quietly observe the peaceful birds in what may or may not be their natural habitat, and find humor in the flatfooted Winter Bluebirds wired onto their tree branches. Unworldly skill would be needed for McCartney to have captured the exact transitional moment when a bird releases its grip from the branch before it starts to hop or fly away. I’m not an armchair traveler but I am definitely an armchair bird-watcher with Paula McCartney’s Bird Watching, and I thoroughly enjoyed the experience. Originally published in photo-eye magazine, March 5, 2010. Books can be purchased through photo-eye. Bird Watching is on view at KLOMPCHING March 4-April 23, 2010; Paula McCartney and Darius Himes discussion and book signing March 6, 2010 from 1-2pm at the gallery. That’s today! An interview with Paula McCartney about visualizing her work in book form and her journey in making the artist book Bird Watching into the trade edition is included in the forthcoming book Publish your Photography Book! by Darius Himes and Mary Virginia Swanson, also by Princeton Architectural Press, Fall 2010. 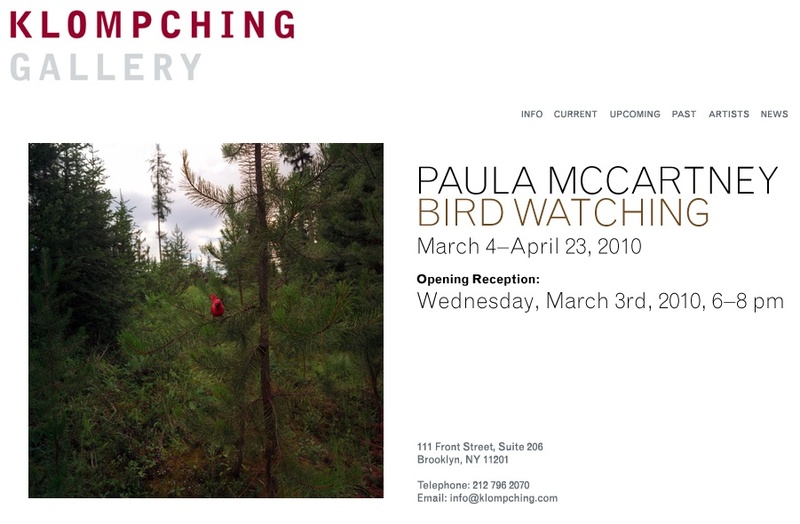 Head over to KlompChing Gallery tonight for Bird Watching (and people watching) from 6-8pm. About her work, Paula McCartney says, “[r]ather than settling for what nature has to offer, I have taken control and adorned the trees with their longed for, but absent, tenants.” The truth is in the details. Look closely. And don’t miss the discussion and book signing with Paula McCartney and Darius Himes on Saturday March 6, 2010 from 1-2PM. 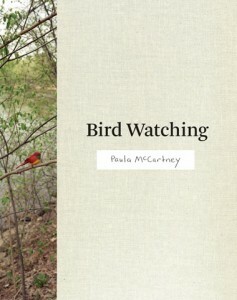 Bird Watching is published by Princeton Architectural Press and is based on McCartney’s artist book of the same name. Related posts: Book Review: Bird Watching by Paula McCartney. You are currently browsing entries tagged with Paula McCartney at Larissa Leclair.